Are Climate Change Mitigation Policies a Form of Insurance? In a previous post, I walked through one of the take-away messages from the latest IPCC report: Using middle-of-the-pack projections, the likely damages from climate change are actually less than what reputable studies estimate as the costs of government action to curb carbon dioxide emissions, such as a carbon tax or cap-and-trade scheme. In other words, even stipulating the entire IPCC framework and numbers, one can make a strong case that “on average” the various proposals to tax and regulate emissions would be a cure worse than the disease: They would cost more in terms of forfeited economic growth than they would save in terms of reduced climate change damages. Far from being a slam-dunk case as it is often portrayed in the media, aggressive government action to slow emissions does not pass a standard cost/benefit test. Precisely because advocates cannot justify their desired proposals on conventional grounds, they have shifted their rhetoric. Climate change mitigation policies are now routinely described as a form of “insurance,” which admittedly may end up costing more than they’re worth, but will give peace of mind by preventing truly catastrophic outcomes. In the present post I’ll explain the shortcomings of this analogy, and show that it doesn’t justify the aggressive policies that many advocate in spite of their collapsing case for alarmism. Before examining climate change, let’s first get our bearings on regular insurance. For example, suppose there are many houses in a certain neighborhood that each have a total value of $500,000. Every year, there is a 1 in 1,000 probability that a given house will burn down. Thus the “expected” loss from fire is $500 per house per year. If a company offered fire insurance policies that provided full indemnification, the “actuarially fair premium” would be $500. However, in practice the insurance company would charge more than that, let’s say $600 (for a 20 percent markup). This margin is to cover overheard expenses as well as provide a return on capital to the investors who started the company. Yet even though there is a sense in which buying such a fire insurance policy is a “bad deal” from the consumer’s point of view—because it costs $600 per year to eliminate an “expected loss” of only $500 per year—economists can easily justify this outcome. Consumers are “risk averse,” and it is completely rational to pay a little bit more than the actuarially fair premium in order to have the peace of mind of not worrying about a catastrophic loss from fire. Notice that with this approach, the deck is now stacked heavily in favor of interventionist policies, because the critic no longer can merely point out the cost of such actions and the unlikelihood of the risks they are allegedly addressing. As Emanuel admits in the quotation above, for the low to medium ranges of impacts, climate change won’t be a big deal; our grandchildren will adapt with little difficulty. Nonetheless, Emanuel still thinks it is perfectly reasonable to take steps just in case the really bad outcomes occur. This rhetorical framing may resonate with many people because—to repeat—people in real life take out insurance policies against such things all the time (risk of a heart attack, house burning down, severe car accident, etc.). Yet even though the rhetorical framing sounds plausible, it’s actually quite misleading. There are many crucial respects in which government efforts to artificially curb greenhouse gas emissions are nothing like private insurance. First of all, the type of insurance people like doesn’t have to be foisted upon them: they buy, say, homeowner’s fire insurance because the benefits of coverage are worth the price of the premium. In contrast, when it comes to forcing people to buy insurance—such as what is happening under the Affordable Care Act (aka “ObamaCare”)—then millions of people are extremely unhappy. Indeed, the Supreme Court had to declare that the “individual mandate” is really just a tax, because the federal government isn’t allowed to force people to buy insurance that they don’t want. On this ground, then, it’s hard to justify climate change policy as insurance, since it forces everybody to buy it even if they don’t agree the benefits outweigh the costs. Another problem with the insurance analogy is that the catastrophic risks from climate change are all theoretical. In contrast, we have solid data on houses burning down, car crashes, and heart attacks. Insurance actuaries can pore over those numbers and come up with reasonable estimates for the likelihood of various events, for given pools of people. There is nothing at all like this in the climate policy debate. If the 21st century unfolds in the same way as the 20th century did, then we will experience modest warming and a mixture of mild benefits and mild harms from the change. There would be no case for aggressive government action at all. It is only by using computer models in which the temperature deviates from historical trends that the alarmist camp can build its case. Part of the problem here is that the alleged catastrophic scenarios from climate change won’t occur until decades or even centuries into the future. So rather than likening government polices to taking out fire insurance on your house, a better analogy would be paying today for a fire insurance policy on your grandchild’s apartment on the moon colony of 2100. Nobody in his right mind would embark on such a path, even if a computer simulation showed that “locking in the rates” today would be much cheaper than deferring the decision so your grandkid had to deal with it. Above we’ve shown the weaknesses in framing government climate change mitigation policies as a form of insurance. But let’s stipulate the analogy, and look at just how overpriced this “insurance” would be. As the bolded portion indicates, even back in 2010 the rhetoric was shifting to show that government action was needed, not so much to deal with what would probably happen, but rather to avoid the unlikely scenarios of what might happen. In the figure above, the IPCC has provided projections of the mean and “envelopes” of warming (in a 66% confidence interval depicted by the gray bands) for four Representative Concentration Pathways (RCPs). For three of them (which may include assumptions of strong government measures to reduce emissions), humanity never comes close to the danger levels of warming. But for the sake of argument, let’s look at the most pessimistic scenario—RPC 8.5. Further, let’s look at the lower end of when we might reach 9 degrees Celsius warming, meaning where the left gray band first hits the 9˚C mark. Eyeballing the chart above, this happens around the year 2145. In other words, even if we just consider the worst-case emission and climate sensitivity scenario reported by the IPCC in its summary chart from its September 2013 update, the suite of IPCC computer models still only assigns a 17% probability that the earth will experience 9 degrees Celsius of warming before the year 2145. In light of the above, let’s pick round numbers and say that a very unlikely outcome—give it a probability of 1 in 500—involves 9˚C of warming by the year 2100. This is the climate change analog of the house burning down. So, does it make sense to “buy fire insurance” against this extremely unlikely, but awful, outcome? No, it doesn’t. Remember, the damage estimate for this amount of warming is around 20 percent of global consumption. (The White House report that gave this figure was relying on the IPCC’s AR4 literature, but we’re just giving a ballpark analysis here.) On the other hand, the latest IPCC Working Group III report estimates that aggressive government policies to limit climate change would cost 3.4 percent of consumption by the year 2050. Would you want to take that deal? Of course not. The premium is way too high in light of the very low probability and the relative modesty of the “catastrophe.” When someone’s house burns down, that’s a much bigger hit than 20% of annual income. And yet, the premiums for fire insurance are quite reasonable; they’re nowhere near 3.4% of income for most households. Moreover, the threat of your house burning down is immediate: It could happen tomorrow, not just fifty years from now. That’s why people have no problem buying fire insurance for their homes. Yet the situation and numbers aren’t anywhere close to analogous when it comes to climate change policies. Recognizing that they can no longer make their case on the basis of down-the-middle projections, those favoring massive government intervention in the name of fighting climate change have resorted to focusing on very unlikely but devastating scenarios. In this context, they have likened their preferred government policies as a form of insurance. However, this analogy fails for several reasons. First, insurance in the marketplace is voluntary; when the government forces people to buy it—as with ObamaCare—then there is indeed a public outcry. Second, actual insurance in the marketplace is based on extensive actuarial data; we have no such understanding with climate change, but instead the outcomes against which we are “insuring” live inside computer projections. Finally, even taking the insurance analogy head-on, the numbers don’t work. Nobody would take out an insurance policy on the terms of likely payouts and expense of premium that climate change policy offers. If the gray band covers the temperature range with 66% confidence, that means the remaining probability of 34% is divided in half (i.e. 17%) and allocated to the left and right sides of the gray band. 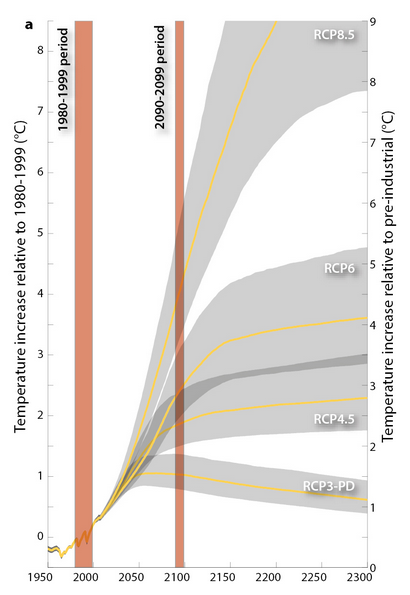 To be clear, there is no way to precisely derive such a figure from the IPCC’s graph. We are merely picking a ballpark figure (which is actually generous) based on the information that the graph does contain. Strictly speaking the climate change literature often deals with percentage reductions in consumption (not income), but it would sound odd for an insurance company to talk that way. The basic point is the same.